a growing political group (source). 2013, 2014, and 2016  (source). “The most generous country in Europe” has become a common boast about Sweden’s 2015 open-door policy for accepting Syrian and Somali war refugees. 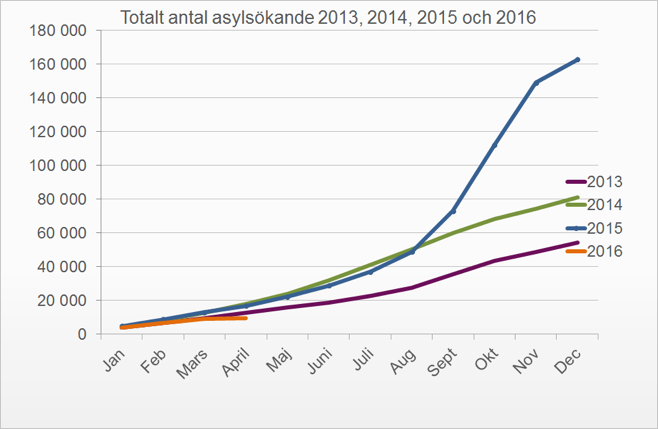 After Germany, Sweden is the destination of choice for many asylum-seekers—and as Figure 1 shows, the number of asylum applications is only increasing. But what are Sweden’s refugee policies once the initial welcome is complete? Where do refugees settle, and what are their daily activities? How do their children integrate into the Swedish educational system? These questions reveal a complex web of answers that can only be found in Swedish policies for refugee settlement, employment, and schooling. After accepting tens of thousands of migrants in 2014 and 2015, the country has been filled nearly to its breaking point. The Swedish Migration Agency has become reliant on available housing in more urban areas and the attitudes of those recipient communities, which has resulted in large clusters of refugees living near larger cities. Södertälje, a town just outside of Stockholm, has a population that is 50% Syrian, Somali, and Afghan refugees . The children living in such areas are being slowly introduced to Swedish schools; what languages will they learn there? Swedish, of course—but what of their mother-tongues and the history and traditions of their families and culture? Sweden is actively trying to provide a permanent home for these refugees, rather than just a temporary residence for the duration of the Syrian Civil War. Assistance is provided to procure housing, find jobs, and send refugee children to Swedish schools. This is a stark contrast to other European countries’ attitudes: Spain, the Netherlands, and now nearby Denmark have tightened border security and are not eager to accept more refugees , . The populations of Syrian, Somali, and Afghan migrants in Sweden already outnumber the older, now-established migrant populations (many of which still speak their mother-tongue) . This more than anything implies that refugee rights (including language rights) will become a point of educational contention in the future. 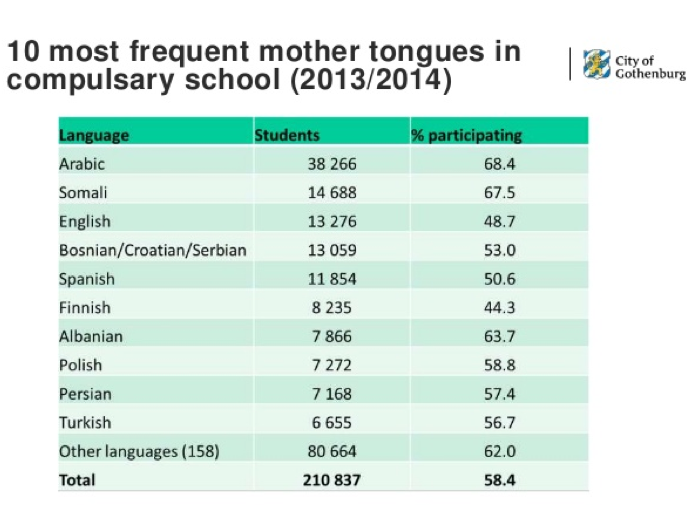 Sweden has liberal language policies for migrant/refugee tongues; Swedish schools are required to provide mother-tongue language classes if more than five students request the instruction and teaching materials/resources can be found . This policy is much more generous than the ECRML (European Charter for Regional or Minority Languages, which Sweden ratified in 2000), which has no provisions for migrant languages or any language that cannot establish historical roots in the country . All of these factors suggest that Swedish government is going above and beyond the minimum duty of EU countries to welcome and settle these refugees (at least linguistically). But these liberal policies are not easily translated into the classrooms—or even into the minds of Swedish natives, who have grown increasingly wary of accepting refugees as readily as they did during 2015, when 1000–3000 asylum application were granted per month . In November 2015, Prime Minister Stefan Löfven announced that Sweden was reversing its open-door policy; after that point, any arriving migrants would no longer receive automatic permanent asylum and the associated benefits. Later in December, the country backtracked even further and announced that Sweden would from then on only accept the EU-negotiated refugee minimum. These cautious decisions are the product of increasing pressure on Swedish schools and a highly competitive job market, as well as social pressure from growing anti-refugee political parties. 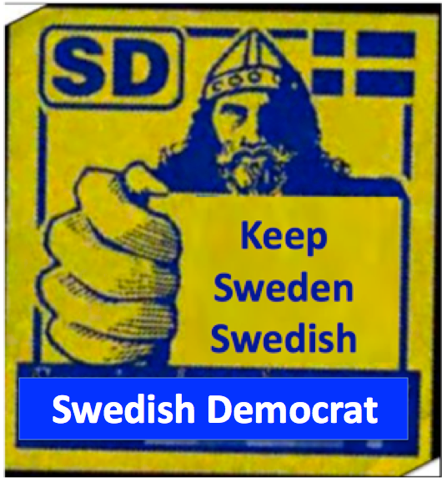 The burgeoning group of Swedish Democrats, which boasts 20% popular support by recent polls, has seized on recent sexual assaults and violence at refugee centers as reasons to stem the flow of migrants; a related point is that most refugees do not socialize with native Swedes (as seen in Södertälje) and the welcoming atmosphere perpetuated by the Swedish government belies the fact that most refugees live in their own communities; these communities are now being treated with suspicion and distaste by many Swedes (especially those associated with the SD, who claim that refugees have “muddied” the waters of a homogeneous Sweden) . Moreover, and ignoring all of these social and political forebodings, these language instruction guarantees for refugee/migrant languages are clearly negative rights; while the government’s policies do not prevent refugees from staying connected with their cultures, there are virtually no government-sponsored televised programming in Arabic, and none of the refugee/migrant languages have been given the same formal municipal power as the traditional minority languages (which in the ECRML include rights within the judiciary, local administration, and cultural programming). The question out of all of this becomes: will refugees in Sweden, despite its accommodating language policies, be able to take advantage of these opportunities to learn their mother-tongue? 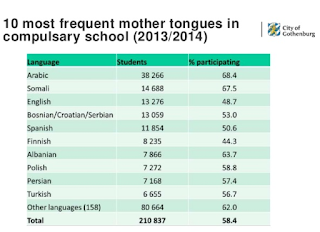 (“Do they even want to?”—as Figure 2 shows, migrant language instruction accounts for a large portion of mother-tongue education in Sweden). Is there legal recourse for refugees if they are denied this right? As of now, the answer falls within a murky territory of available school resources and community attitudes toward migrants. Despite the social and political blowback in the last few months, the refugees currently settled in Sweden will acculturate (not necessarily assimilate) to the country’s culture in the upcoming years; they will still retain their own religion and language, and the latter will have to account for a measurable rise in Arabic and Somali instruction in Swedish schools. Now is the time that refugees will have to establish their right to mother-tongue instruction if they hope to preserve (at least through their children) this major bridge to their past lives. 1. "Statistics." Swedish Migration Agency. N.p., n.d. Web. 30 Mar. 2016. 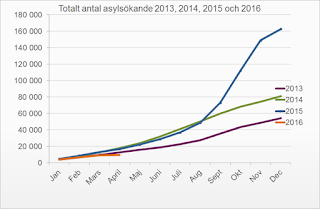 <http://www.migrationsverket.se/English/About-the-Migration-Agency/Facts-and-statistics-/Statistics.html> . 2. Harress, Christopher. "Syrian And Iraqi Refugees Are Half The Population Of This Swedish City." International Business Times. N.p., 03 July 2014. Web. 28 Mar. 2016. 3. Pabst, Sabrina. "How EU Countries Handle the Refugee Crisis | Europe | DW.COM | 12.08.2015." DW.COM. N.p., 12 Aug. 2015. Web. 4 Apr. 2016. <http://www.dw.com/en/how-eu-countries-handle-the-refugee-crisis/a-18646316>. 4. "Protection and Asylum in Sweden." Swedish Migration Agency. N.p., n.d. Web. 6 Apr. 2016. 1. <http://www.migrationsverket.se/English/Private-individuals/Protection-and-asylum-in-Sweden.html>. 5. "Statistical Database." Statistical Database. N.p., n.d. Web. 10 Apr. 2016. <http://www.statistikdatabasen.scb.se/pxweb/en/ssd/?rxid=f27ec97e-43e0-4a1c-9092-f7a2289ac255>. 6. Segerhammar, Amor, and Ann-Charlotte Karnermo. "Language Policy for Migrant Children in Sweden." Language Policy for Migrant Children in Sweden. Language Center Gothenburg, Sweden, 10 Nov. 2015. Web. 5 Apr. 2016. <http://www.slideshare.net/Rutufoundation/language-policy-for-migrant-children-in-sweden>. 7. "European Charter for Regional or Minority Languages." Treaty Office. The Council of Europe, n.d. Web. 30 Mar. 2016. <http://www.coe.int/en/web/conventions/full-list/-/conventions/treaty/148>. 8. Traub, James. "The Death of the Most Generous Nation on Earth." Foreign Policy The Death of the Most Generous Nation on Earth Comments. N.p., 10 Feb. 2016. Web. 30 Mar. 2016. <http://foreignpolicy.com/2016/02/10/the-death-of-the-most-generous-nation-on-earth-sweden-syria-refugee-europe/>. 9. Crouch, David. "Sweden Slams Shut Its Open-door Policy towards Refugees." The Guardian. Guardian News and Media, 24 Nov. 2015. Web. 4 Apr. 2016. <http://www.theguardian.com/world/2015/nov/24/sweden-asylum-seekers-refugees-policy-reversal>. When and Why Did Greek Become Irrelevant?